Mix together cassava flour and salt and spread evenly on the bottom of a small Dutch pot or heavy-based pan. Let brown lightly, flip to the other side and let brown lightly. 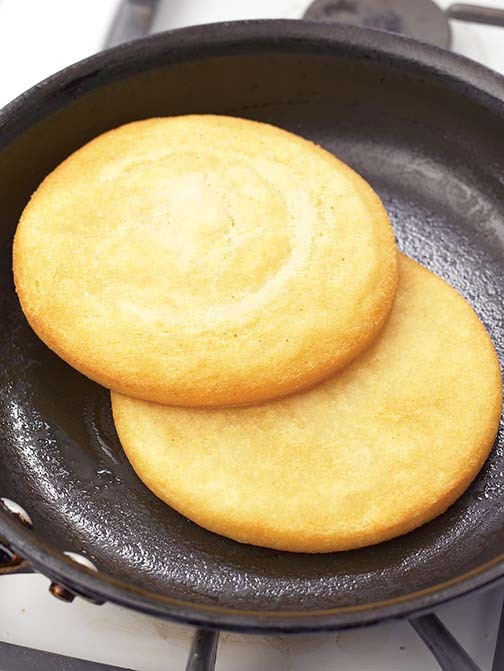 Sprinkle about 1/4 cup of cassava flour, mixed with a pinch of salt, at the bottom of the Dutch pot or sauce pan – enough just to make a thin layer. Let it brown very lightly on both sides. Fill with prepared vegetables, meat, sauce or whatever you desire. Soak the bammy in milk for 1 minute with a pinch of salt. Drain milk from bammy. Place some butter in a saute pan and cook bammy on both sides until golden brown. Mix pepper, salt and milk in a shallow bowl. Soak bammy in the mixture then fry in greased, non-stick pan. Eat plain or with sprat, chicken, avocado or anything else you desire. Soak bammy in a mixture of milk and water (just enough to cover the bammy) and salt. Let soak – overnight if possible. bammy, butter the pieces on both sides and place in pan. Cover and let steam until brown – 5 to 6 minutes for each side. The steamed bammy is soft and chewy. Drizzle honey or pancake syrup on top, or eat with ackee and saltfish, escoveitch fish, avocado, scrambled eggs, or any topping of your choice.